Adnan Januzaj has done an interview with Mundo Deportivo in which he hints that Paul Pogba is keen on playing in Spain one day. That is sure to excite Real Madrid fans who have seen their club linked with the Frenchman since his rise to prominence at Juventus. Real Madrid winger Januzaj, who came through the youth system at United with Pogba, suggests his former teammate would like to play in Spain. While Madrid are set to splash the cash over the summer, it would be a shock to see the midfielder leave Old Trafford in the coming months. He still have unfinished business at United and Ole Gunnar Solskjaer’s arrival has given everyone a lift. Januzaj told Mundo Deportivo: “We have known each other since we were very young, we have done everything together. Januzaj isn’t quite cut out for the highest standard but he showed promise during his early days in the first team. He’s obviously a player Ole Gunnar Solskjaer knows from the youth teams, so it would have been interesting to see what use he’d make of the winger if he was still at the club. 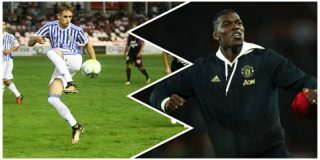 But Real Madrid aren’t the only Spanish side to have been linked with Pogba in recent months. His willingness to play in Spain could also see Barcelona as a possible destination for the future.